Hey, it was a shootout. Shootouts are glorified coin flips. Sometimes, they go the other way. Agree? Hey, it was by one goal. As hot as the Lightning have been for most of the season, they're allowed to lose a one-goal game. Right? Hey, Vegas is a quality opponent. The Knights were in the NHL Finals last year, for crying out loud. There is no shame in losing to them. Check? 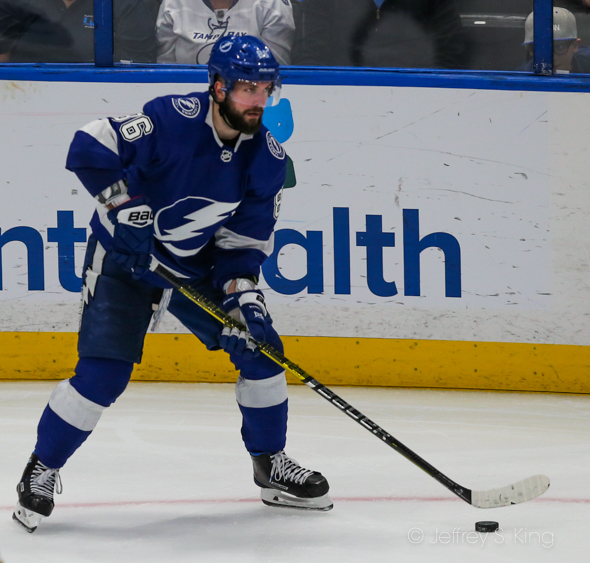 On the other hand, do you feel the rest of the NHL sneaking up on the Tampa Bay Lightning? Okay, okay. Early February is no time to panic, but the Lightning lost a 3-2 shootout to Vegas Tuesday night. They blew a two-goal lead in the process and wasted a 35-save effort by goaltender Andrei Vasilevskiy, who fell to 21-7-2 on the season. It lowered the Bolts' record to 39-11-3.
too. Tampa Bay is now 4-4 in its last eight games, and the goals seem to be harder to come by. The Bolts have just 19 goals in their last eight games and have scored more than three goals only once. Tampa Bay's best shot in overtime was hurt by a two-minute penalty for having too many men on the ice. They killed it off, with Vasilevskiy stopping six shots, but they never mustered a scoring threat. The Bolts missed all three of their shootout attempts. Alex Tuch scored the only shootout goal for Vegas to win the game. 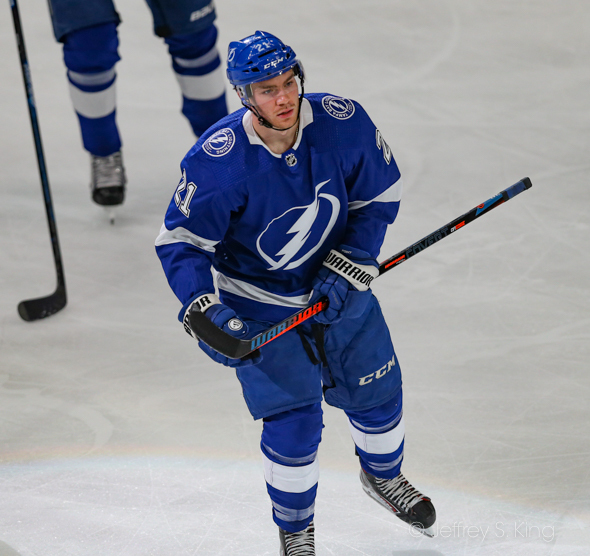 The Bolts got goals from Brayden Point and Mathieu Joseph in their loss. 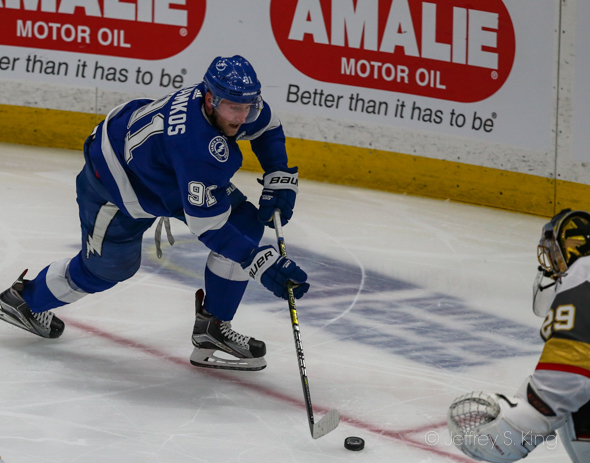 "It wasn’t the worst game we played all year and it wasn’t our best," said Lightning coach Jon Cooper. "It was pretty fitting it went to a shootout." Cooper, looking on the bright side of things, pointed to the Lightning's better play on defense. Cooper expected the shootout to be low scoring. Point, who scored his 31st goal, said that it was simply a close loss. "Losing a lead is tough at home, but I think we had a few PP chances where we could've scored," Point said. "I don't know if we necessarily shot ourselves in the foot. I thought it was a tough game, good battle, good saves either way. "Things have gone so good for us this year so sometimes it's kind of easy to nitpick when we lose. I think sometimes you just go through highs and lows and sometimes you don't find ways to win games. Think that's going to happen for us, but we are back in the groove, we're back in the rhythm, this is what we do." Steven Stamkos didn't dismiss the effort in the same way. The Bolts are home again on Thursday night in a game against the St. Louis Blues. The puck is scheduled to drop at 7:30 p.m.
Next post: Will signees ever amount to anything for anyone?